I woke up bright and early at six a.m. to get ready to meet the girls from my class at seven. 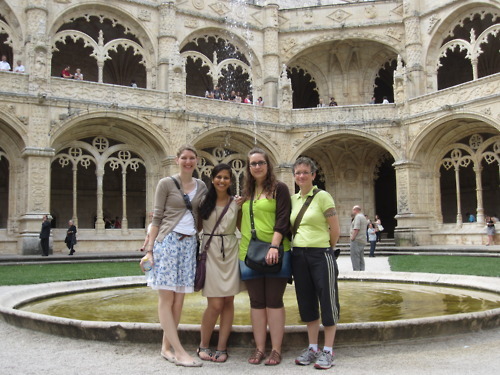 We are two Germans, a French girl and an American traveling together to Lisboa, Portugal. Our only method of communication between each other is to speak Spanish and a bit of English! We crossed into Portugal in about an hour and were in Lisbon in 3 hours. After a bit of searching, we finally found the hostel, parked and checked in. Luckily the room was available even though it was only 10:30 in the morning (Portugal is one hour behind Spain). We then made plans to go to the center of the city first and visit the Tourist office so it was off to the metro! We bought 24 -hour metro cards and scrambled onto the next train (it felt like New York) and soon we were there. We hopped off and exited onto a very commercial, almost mall-like street. To our right was a beautiful arch with a little peek of the ocean while the streets on both sides were lined with all sorts of stores and shops. We stood in line at the Tourist box for about 20 minutes and grabbed a few pamphlets and crossed under the arch to enter the main plaza of Portugal. It was huge!! The best part was being able to see the ocean. We took a few pictures before realizing how hungry we were, so we sat down at a cafe on the plaza. I had a spinach and cheese crepe with this Portuguese soda called Sumol (think orange juice mixed with soda). 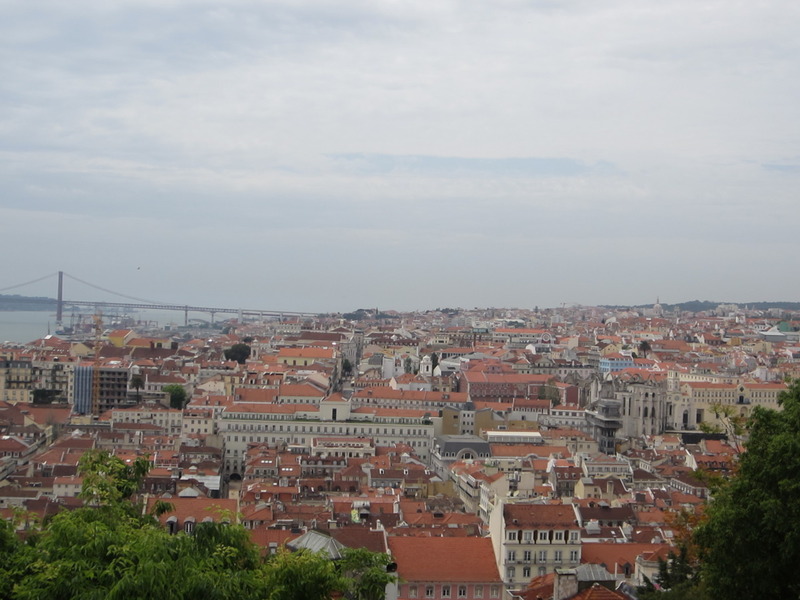 We then started making our way to Castillo Sao Jorge (A castle from Moorish times) perched up on a big hill. The Castille was very interesting to visit. 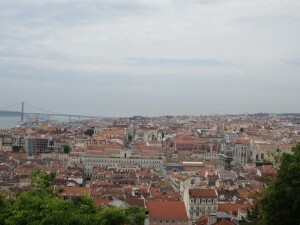 Before you enter, there is a nice garden with amazing views of Lisboa, the ocean and the famous "April 25th" Bridge. We spent about an hour just walking around because it was huge! We then headed inside the castle, which was interesting because you could climb up and walk around where. back in the day, guards would be posted, prepared to respond to any attackers. I love to imagine what it would have been like to experience the castle when it was used. We then found a tram, and with a few changes in between, we were in Belem. We walked around admiring the monastery, Discovery Monument and the Torre de Belem, all which we would visit the next day. We were also right next to the beach, so it felt very nice. Everyone wanted to have fish for dinner because Portugal is known for their fish dishes. We just walked along the beach until we found a restaurant which seemed to have decent food and prices. Something interesting about Portugal! When you go to a restaurant and sit down they'll bring you bread and cheese and other food. If you eat it, you pay for it, if you don't eat it, you don't pay for it. But you have to be careful because they don't tell you that! Luckily, people at school warned us before we went, but if someone put a bread basket in front of me at a restaurant, I would assume it was gratis! We spent a long time eating and relaxing and it was about 21:00 by the time we finished. It was time for a paseo in what is known as the neighborhood of Bario Alto. However, streets are even more confusing in Portugal than in Spain and it was awhile before we found it. Outside of the neighborhood, Lisboa was so quiet! We finally found a nice cafe and sat down to grab a drink. It was a nice way to relax because the cafe was full of locals and it was a great atmosphere to be in! My alarm for this morning was set for 8:15 a.m. but we ended up waking up around 7:30 a.m. because it was so bright and so HOT. We all got ready and headed down to breakfast in the common room of the hostel. Breakfast was filling with lots of bread, cookies, cereal, coffee and juice. Because we weren't going to return to the hostel, we drove to Belem in Jeanette's car. First we were off to the Monastario de Jeronimos which had the most amazing courtyard I've ever seen. It was really beautiful. I also saw the tomb of Vasco de Gama which was cool after learning about him in high school. After the monastery, Claudia and I headed up to the top of the Discoveries Monument while Emile and Jeanette waiting below (they're both scared of heights). While we were up there, we met another girl from Spain who heard us speaking in Spanglish. She was actually going to move to Germany to teach Spanish which was hilarious because Claudia is from Germany! It was random. The Discovery Monument provided great views of the "April 25th" Bridge (called that because it was the day Portugal revolted and went on to become an independent country from Spanish rule). What is super interesting is that although Portugal is directly next to Spain, almost no one speaks Spanish! Instead, they all speak English! This is literally because Portuguese people are still a bit "upset" that at one point Spain ruled Portugal. I've become so accustomed to speaking Spanish that I would have to remind myself to speak English! Belem is known for it's little cakes called Pasteis de Belem. Through Rick Steves, I learned of the cafe that first started making the cakes based on very old recipe from nuns at the monastery. 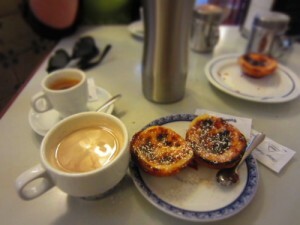 We headed to the cafe- also called Pasteis de Belem- which was extremely crowded. It is supposed to be a local hangout, but I believe word of it spread, and now there is an incredible amount of tourists. We had to wait (and hunt for a table). Emile and I ended up ordering 2 cakes each and poured on the cinnamon and powdered sugar before digging in!